Attach pieces of brown yarn or string to the front of a solid (or multi colored) note card for a mane. Attach a smaller bunch on the back of the card for the tail. Pretty note cards with carousel horse designs or stickers. Print out party details on large address labels. Then stick the labels on colorful bandanas and pass them out to party guests as an invitation. On the label or invitation tell party guests to wear the bandana to the birthday party. Make invitations in the shape of horseshoes. 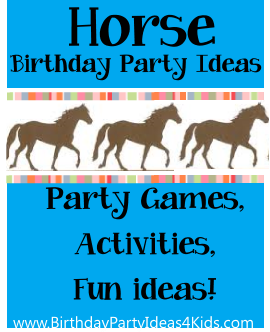 Cut out horseshoe shapes from construction paper or poster board and tape them to the driveway or walkway leading up to the party so it looks like a herd of horses walked to the party before the other guests. 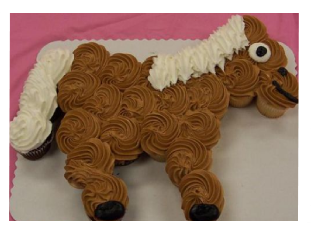 Decorate the birthday tables to look like the inside of a stable with lanterns and bales of hay on the table. Add cowboy boots, spurs and rope for a western look. Set out small metal buckets on the party table and fill with snacks. A large rectangular container can be set out like a trough - fill it with ice to keep drinks cold. You will need a broom stick or large dowel rod for each child, old socks, cotton batting, yarn, felt, glue and googly eyes. Stuff the socks with the cotton batting and then place the end of the sock over the broom stick and tie it on for the horses head. Glue the eyes onto the sock and make a nose (two black circles) and ears from the felt. The yarn can be glued on the part of the sock that is over the stick to make a horses mane. Braid three long pieces of yarn together and attach them underneath the head to make the reins. Make up several relay races and barrel races and let the children run them with their mop horses. Or buy two stick horses and let the kids trade off with each other. on our how to play horseshoes page. Let the kids have some fun while they play this game ... the kids will get wet so make sure and play this outside. Great for a summer day when they need to cool off! You will need 2 large tubs filled with water and two rectangle shaped horse trough containers that hold the same amount of water. The goal is for the teams to get their trough filled first. Teams will one at a time take a plastic cup (punch equal amount of holes in the bottom of each cup so that the water will slowly leak out) and run from the large container to their trough. First team to fill up their trough wins.